Researchers have long been looking for ways to reduce unnecessary breast biopsies. Doing that would, in turn, relieve stress on patients and reduce healthcare costs. Generally, when a suspicious lesion is found, doctors recommend that it be biopsied to determine whether it is malignant or benign. The sensitivity of the various imaging modalities is high, but the specificity is not. Up to 80% of breast lesions that are biopsied turn out to be benign, according to the American Cancer Society. Suspicious lesions found on screening mammography may be followed with additional mammographic views, MRI, or ultrasound. Now, researchers at Jefferson Medical College of Thomas Jefferson University in Philadelphia are investigating contrast-enhanced subharmonic ultrasound as a noninvasive exam that could help physicians make a diagnosis. In subharmonic imaging, pulses are transmitted at one frequency, but only echoes at half that frequency are received. Subharmonic imaging of the breast is not meant to find lesions but to characterize them once they are detected by other modalities, says Flemming Forsberg, PhD, FAIUM, FAIMBE, head of research for the Jefferson Ultrasound Research and Education Institute and an associate professor in the department of radiology. He has been working with the technique for the past eight years. Forsberg explains that subharmonic imaging provides a higher contrast between biological tissues and blood flow because echo signals are generated only from blood containing the contrast agents. Cancer is known to have high vascularity. Using this technique, it is possible to tell whether the suspicious lesion has the vascular morphology that is often indicative of cancer, Forsberg says. 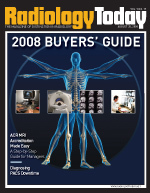 In a study reported in the September 2007 issue of Radiology, researchers tested their technique on 14 women ranging in age from 37 to 66 who had 16 biopsy-proven lesions. The researchers used a GE Logiq 9 ultrasound machine that was modified to perform grayscale subharmonic imaging, transmitting at 4.4 megahertz and receiving at 2.2 megahertz. The women underwent precontrast imaging and imaging using contrast. The researchers used the same contrast agent that is used in echocardiography. “It is not that it is necessarily the best agent to choose for this imaging mode, but it is the safest in the eyes of the U.S. Food and Drug Administration,” Forsberg says. The researchers’ results using subharmonic imaging were better than conventional ultrasound and mammography. Of the 16 lesions, four were malignant. Mammography had 100% sensitivity and 20% specificity for these lesions. Subharmonic imaging had 75% sensitivity and 83% specificity for the same lesions. “Specificity was higher for all ultrasound modes than for mammography,” Forsberg says. The U.S. Department of Defense’s Breast Cancer Research Program funded Forsberg’s research in this pilot study. The group is looking for more funding from the National Institutes of Health (NIH) so it can continue to investigate subharmonic imaging’s possible role in improving the diagnosis of breast cancer. Forsberg says that without larger studies, it is hard to say with any authority, but he believes that subharmonic imaging could provide a real improvement to breast imaging and patient care. Researchers at Duke University in North Carolina have developed a new scanner that they believe is better at finding early cancers in women than conventional mammography, and it can also be used for diagnosis and monitoring of therapeutic response(s). It is a hybrid between a SPECT and a CT scanner they are collectively calling mammotomography. Martin P. Tornai, PhD, a biomedical physicist and associate professor of radiology at Duke, says the hybrid scanner he and his colleagues have built has advantages because it produces a high-resolution 3D image that doesn’t require the breast to be compressed, and it does so with lower doses of radiation—about one tenth of that delivered during mammography. Tornai says his team has built two systems—a dedicated breast SPECT scanner and dedicated breast CT scanner—separately, but their intention all along was to combine the two so that the resulting hybrid images would provide anatomical and functional information, making it possible to not only find and characterize lesions but also determine where they are in the breast. The hybrid scanner contains both imaging modalities positioned perpendicularly to each other with respect to a shared field of view. The hybrid scanner that the researchers have built from novel configurations of conventional equipment circles the breast as the patient lies on a specially built table. The scanner is also able to see areas, including the chest wall, that traditional mammograms may not, Tornai says. By registering and fusing the images from the nuclear medicine SPECT scan and CT, the radiologist can see exactly what’s going on and where, Tornai says. He says he initially built the scanner as two separate pieces of equipment because it was easier that way. “It was easier to ensure they work the way we envisioned and then to initiate patient studies and then to put the two together. That was the intent all along in my NIH-funded research,” he says. Tornai has tested the hybrid scanner extensively with phantoms and has begun successfully scanning subjects with known cancer. He says it could take anywhere from five to 10 years to commercialize the scanner because of what is necessary to get more funding and obtaining FDA approval. One of Tornai’s goals in designing the scanner was that it be comfortable. Many women, he says, do not undergo screening mammography because the compression is painful. He thinks more women might be amenable to getting their annual breast exams if it were a more comfortable procedure. Because SPECT requires IV injection of imaging agents, the SPECT portion of the scanner would not likely be broadly used for routine screening mammography, Tornai says. However, he says, if it proves to be more effective, the hybrid SPECT/CT system might be especially helpful for women who are at high risk for developing breast cancer because of familial history or a genetic predisposition. Breast SPECT/CT also could be used for women with dense breasts or implants because mammography is known to miss up to 25% of cancers in these women, Tornai says. The scanner and associated imaging procedure also should be less costly to employ than MRI, he adds.